Tinychat, a free service that allows you to create a free disposable chat room, now has free video chat which supports up to 12 concurrent broadcasters and unlimited viewers. 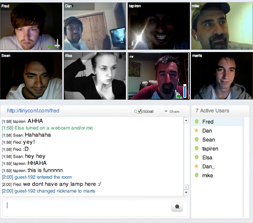 Tinychat is completely browser and OS independent, so it works on anything that supports flash. It also has desktop sharing, recording, passwording and HD video upgrades. You can set a broadcast password to do a live show, and only those who know the pass can go on audio/video. Everyone else can only do text chat.